Night Shift is an anthology comprised of four stories by two urban fantasy and two paranormal romance authors. I’ve only read the urban fantasy parts since paranormal romance still gives me severe allergies, but the two stories I have read, Magic Steals by Ilona Andrews and Lucky Charms by Lisa Shearin are completely worth the price of this book. Magic Steals by Ilona Andrews: I expect nothing short of perfection from Ilona and Gordon, and rightfully so. Magic Steals focuses on Jim and Dali, during the time Kate and Curran had spent chasing the panacea in Europe. This is not the first Jim and Dali novella so the two are already a couple, but they are weighed down by Dali’s insecurities and Jim’s position with the pack. There were times when I intensely disliked Jim and some of the choices he’s made along the way, but Magic Steals shows us a whole new side of him. I didn’t think the man had a romantic bone in his body, but he is a completely different person with Dali, someone who actually knows how to relax and have fun. He is also a very smart guy, which is no news to us, and he has to be to attract someone like Dali. For her part, Dali is portrayed like a real badass in this novella, not so much physically, but certainly magically. Her exact role was previously unclear, but as we learn more, our respect for her grows significantly. In short, this novella is not to be missed by Kate Daniels fans. Kate and Curran are completely absent, but Jim and Dali are worthy replacement. The action and mythological background are extraordinary, as one would expect from this writing pair. The anthology is worth buying for this story alone. Lucky Charms by Lisa Shearin is a prequel of sorts to her SPI Files series. I read The Grendel Affair earlier this year and loved it, which made this story even more entertaining to read. We see Makenna Frazier on her first day working for the SPI as a seer. She and her reluctant partner/bodyguard Ian, along with a team of SPI agents, have to locate a leprechaun prince who doesn’t want to be found and prevent a conflict with the goblins while doing it. Mac is given no time to adjust to her new job. The mission is extremely important and since she’s the only one who can recognize the leprechauns even under glamour, her participation is essential. Shearin’s worldbuilding relies on very familiar creatures and myths. These days, I like to be exposed to something new and unexplored. In this, all urban fantasy authors should take lessons from Ilona Andrews. But even with dragons and leprechauns, goblins and werewolves, Shearin built a full picture that is wildly entertaining. This series is extremely promising and this story makes it even more so, but I’ll reserve my final judgment for January 2015, when the second book comes out. Overall, Kate Daniels fans, Nalini Singh fans, you know you won’t be able to resist. I’ll probably read Nalini Singh’s story at some point, even with my allergies to paranormal romance. I'm listening this now. I'm on the last story, which seems more fantasy than anything. 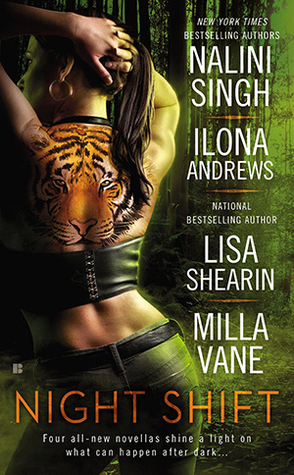 I'm a huge fan of Nalini Singh and Ilona Andrews. This is my first time with Lisa Shearin and I enjoyed this first story. I will be looking up more books in this series. I'm so jelly that you got a review copy of this! Mind you, I didn't try very hard because the only author who's series I'm up to date on is Ilona Andrews, so I figured that I wouldn't really be able to appreciate the full extent of it anyway. Four stars is a pretty solid rating for an anthology. Jenny also really enjoyed the Illona Andrews book. I seriously need to give something by this duo a try. I promise I will very soon. I'm so happy you enjoyed these two novellas, Maja. I would read this for the Kate Daniel series alone! So glad it was a good one. Sounds like something a fan of both series should do some grabbyhands at. I actually haven't read either just yet. Don't worry, I will eventually, everyone raves and screams at me to read them, lol! Great reviews though, I'll keep them in mind when I do get around to reading them. I love Jim and Dali! I'm thrilled we get to see them together again. I'm also a big fan of Nalini Singh's paranormal romance series. I do hope you give her story a shot, Maja. I think you would really like it! I don't read anthologies often though I just cleaned my shelves and found a ton with UF and PNR stories. Mostly from series I haven't started or at least haven't finished. I do like Lisa Shearin though. Well, this is probably a good book to get for non-readers of both sub-genres. Though the more I think about it, the more I think we might be a bit lost since they're novellas based on full length series.